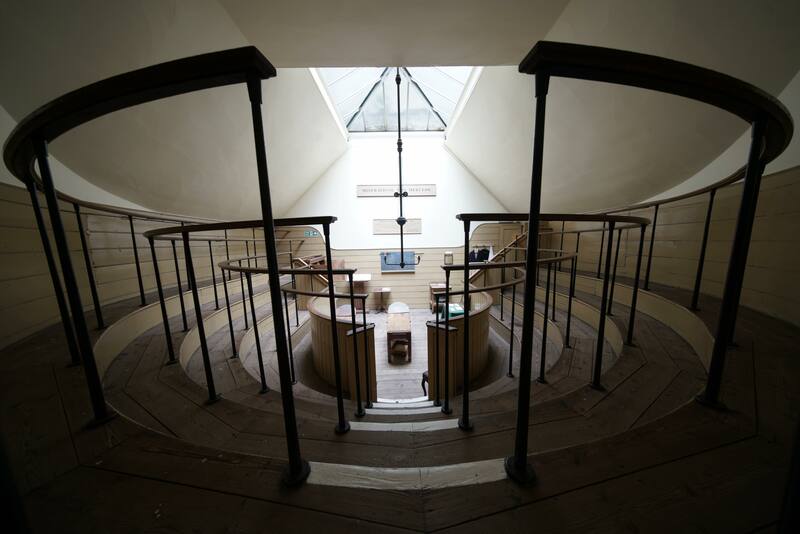 Old Operating Theatre in London at the Herb Garret Museum and now part of the London Science Gallery. Photo: John A Douglas. In 2016 John A Douglas was awarded the inaugural Artist with Disability Fellowship. John A Douglas is a Sydney-based interdisciplinary artist working across video, performance, live art installation and photomedia. We caught up with John A Douglas recently to find out how his Fellowship is tracking. We caught up with John A Douglas to find out how his Fellowship is tracking. How did the idea for your Fellowship activities come about? In 2016, I was in the process of completing the first part of a large scale video piece while also shooting a project for Kate Scardifield. We became aware through numerous conversations of our mutual interest in the medical body and anatomy, in particular, the historical perspectives of dissection/surgery of the body as spectacle. I had just completed shooting a collaborative performance video interpreting my own surgery and near death experience. I read Kate’s PhD, which resonated very strongly with me, and chose to follow her path of research which included museum visits in Italy, France and the United Kingdom (UK). I was also interested in developing skills in collage using various materials with photographs, which I have been looking at doing in a new series of work titled Physica Sacra. The work is based on a rare book of esoteric scientific engravings from the 18th Century. There was also a need in my practice as a video artist and videographer to develop my skills as I had recently started shooting in UHD and teaching myself colour grading. I had also done some simple animation work but felt the need to now move into 3D animation and learn digital lighting techniques as well as developing my studio and on location practice in analogue and digital photography. Finally, I had developed an ongoing relationship with Alejandro Rolandi who specialises in aerial and physical theatre and wanted to take that part of my practice to the next level for video and live performance. Ultimately, I wanted to create a program of activities that was highly interdisciplinary and most importantly, as an artist with disability, achievable over a long period of time. Your Fellowship involves a mentorship and internship program, and undertaking research overseas. Can you tell us about what you’ll be doing and where you’re travelling? I’ve just returned from travelling to Rome, Abruzzi, Florence and Bologna in Italy and the UK where I was able to view exhibits at several anatomical museums and photograph some of the objects as well as landscapes and ancient ruins. 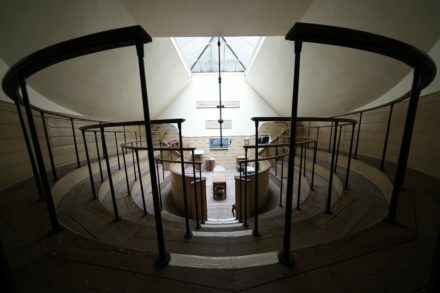 I was also given permission to shoot the interior of the Old Operating Theatre in London, attend a conference in Glasgow and undertake research at the Wellcome Institute Library in London. The research will go towards several new projects I’m undertaking over the next two years which will involve working in collage, animation and performance. I’ll be working towards incorporating an archive of landscapes and objects I’ve been photographing over the last two years along with the material I shot in Europe. There will be some overlap with a live work I am currently developing with Performance Space which was funded by the Australia Council. Further skills in the area of 3D composition and physical performance will go towards all of my upcoming exhibitions and projects. How will this Fellowship impact your professional development? The biggest impact will be on the ability to broaden my skills in both theoretical research and practical skills development. It is also often difficult to spend time to focus on reading and collating findings on study based research activities on top of the production side of things. The biggest advantage will be to have the invaluable resource of mentors to advise, assist and support my practice. Apart from the challenges of getting work across the line, it can often be the case where it seems impossible to be able to adequately complete a project due to the limitations of my condition. In addition, being in contact and working in a variety of studio-based environments I am hoping to make contacts with curators and other industry professionals. What other funding opportunities have you received that have supported your development throughout your career? I have been fortunate enough to have been funded by the Australia Council for the development and production of new work over the past five years. Without this support it would not have been possible to make these projects. As a person with chronic illness on a low income, I have struggled like may others, to maintain a practice which often means an exhibition history that is inconsistent and patchy. This support has been crucial to my survival as an artist. In 2017, what are you most excited by – as an artist or as an audience member? I am particularly excited by modes of artistic and curatorial practice that work both inside and outside of studio-based practice – breaking the boundaries of being confined to one specific artform and area of research. In addition to artists who are able to create works that are informed by political, social, scientific and philosophical subjects and can transform them to create works that are not limited to the gallery or museum. I am often captivated by curators who take audiences on a journey that is not just limited by a specific genre or period but are able to join the dots and present works that are contextualised into a multiplicity of ideas without being dry and overly academic. Promoting and supporting diversity and developing inclusive arts practices plays a major role in the NSW Government’s vision for arts and culture in this state, as outlined in the 10-year policy framework, Create in NSW.